CLIFFORD LEOPOLD ALEXANDER, JR., was born in New York City on 21 September 1933; attended the Ethical Culture and Fieldston Schools there; graduated from Harvard University, 1955; graduated from Yale University Law School, 1958; enlisted in the New York National Guard, 1958; served briefly with the 369th Field Artillery Battalion at Fort Dix, New Jersey; married Adele Logan, 1959; was admitted to the bar; served as an assistant district attorney for New York County, 1959�1961; became executive director of the Manhattanville Hamilton Grange Neighborhood Conservation Project, then program and executive director of Harlem Youth Opportunities; practiced law in New York City; was called to Washington to serve as a foreign affairs officer on the National Security Council staff, 1963; was successively deputy special assistant to the President, associate special counsel, and deputy special counsel on the White House staff, 1964�1967; was chairman of the U.S. 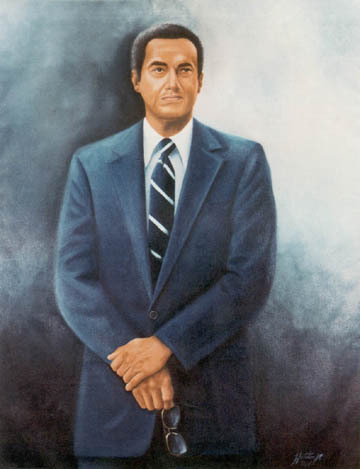 Equal Employment Opportunity Commission, 1967�1969; was a special representative of the President and headed the U.S. delegation to ceremonies marking the independence of the Kingdom of Swaziland, 1968; practiced law with the Washington firm of Arnold and Porter, 1969�1975; was a television news commentator in Washington, 1972�1976; was a professor of law at Howard University, 1973�1974; ran unsuccessfully as a candidate for mayor of the District of Columbia, 1974; became a partner in the law firm of Verner, Liipfert, Bernhard, McPherson, and Alexander, 1975; served as Secretary of the Army, 14 February 1977�20 January 1981; concentrated upon making the all-volunteer Army work, stressed programs to enhance professionalism, and emphasized the award of contracts to minority businesses; formed the consulting firm of Alexander and Associates, 1981; serves on the boards of directors of several national corporations; is a member of the Board of Governors of the American Stock Exchange. Harrison Edward Benton, Jr., has been an artist for as long as he can remember. He received his Bachelor of Fine Arts degree from Maryland Institute of Art, Baltimore, Maryland. His entire career has been oriented toward art. A longtime Department of Defense employee, he currently heads Presentations and Graphics in the Directorate of Programs and Evaluation for the U.S. Air Force. In recognition of his accomplishments as a portrait artist, he has been inducted into the prestigious Society of Illustrators (New York) and the American Portrait Society. By Harrison Edward Benton, Jr.